1) I can get Laser parts anytime, new or used. 1) Spacious, more comfortable, can take people out !!! 5) Worried about parts !!!!!!!!!!!!!!!!!!!!!!!!!!!!!!!!!!!!!!!!!!!!!!!!! Any input, wisdom, & experience is GREATLY appreciated !!!!!! 1) I can get Laser parts anytime, new or used. True, but the Laser is a one-design boat so parts may not be the most cost effective. As a one-design boat, any modifications you do may invalidate the design rules. Not a problem if you just want a fun fast day-sailor, but you may take a hit on resale or if you decide you eventually want to race (or your kids when they grow up). What parts are you worried about? Most everything can be replaced with off the shelf parts, except the very costly like booms, masts, etc. and replacements of those are available with modifications to existing off the shelf (or off the web) equivalents. I learned on a Chrysler Lone Star 16 and it was a very abused boat when I got it. I replaced all of the running rigging, blocks, some of the standing rigging, refinished the bilge boards (aluminum), fixed lots of fiberglass, refinished the bottom, and so on and so on. AND you have the expertise of my fellow Chrysler sailors. It boils down to what you want to do with the boat. If you want to race with other boats of one class by all means buy the Laser (I wanted one once, long ago). If you want to cruse and have fun on the water with your family, I would go with the Pirateer. And I'll bet it's cheaper. all about cruising and taking kids & friends- not competitive racing. When buying a boat, try to make sure you get all the parts with the boat. even if the parts are worn out. It is much easier to replace a part if you have a pattern. All the lines, blocks, goose neck, and such are gernerally easy to find replacements. Maybe not exact but almost always workable. Classic example is my 22 "Lady Jo" I bought her basically as a derlic boat. No boom, sails, lines, missing most blocks and such. Even the rudder was bent badly. 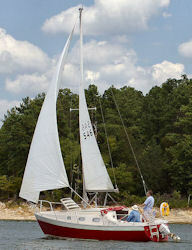 Today she is a sweetheart fully rigged and can sail any waters immediatly! So, do be afraid of a boat in need if you are willing to take the time and effort to make her nice! Day 1 after prepping to bring her home! -do I absolutely have to use the spreaders on the mast? Third party stays? I assume you mean standing rigging. If so you can get them made to order. I would recommend turnbuckles, even though I don't adjust Windwalker's often. Wire rope, especially new, can stretch slightly over time, thermal expansion, no need to measure your new standing rigging precisely, and then crossing your fingers hopping the riggers git it perfect. Spreaders, why not? Easy to replace with off the shelf materials. I don't know the implications of removing them with this boat but if you do you can be sure the rigging will no longer fit. Luck on your new boat. Again, Dave is on the money! Spreaders are generally designed to help support the mast. In supporting the mast they may be design to induce mast bend ore reduce mast bend when the windward shroud is under load. I would not remove the spreaders. Period. Also as Dave indicated, you're shrouds will be to long if you remove the spreaders. Sounds like you have made up your mind! Please share photos when you buy your new boat! Will definitely rig with spreaders. Good to no you can get the shrouds custom made too. Can I get new sails from Intensity or Shurr ?? I just went to Intensity web site and didn't see "Chrysler"
size close to the Pirateer that has a sail that will fit ?